Again, another killer deal at Amazon for BBE pedals. Today is the BBE Crusher high gain distortion pedal which has a passive 3 band eq (bass, mid, treble) on it. Normally, this pedal lists for $129.00, Musician’s Friend has it for $79.99 + shipping, but Amazon has it for only $51.98 and you can also get it with FREE super saver shipping! Not a bad price. The Crusher distortion pedal employs a passive 3-band EQ to shape the massive high-gain output to your pleasure. Anything from a mild crunch to brutal, in-your-face distortion is possible. The Crusher is built to last and features hardwire bypass, high-gain distortion circuit, LED operation indicator, non-slip rubber bottom, and an easy-access 9V battery compartment. Includes AC power supply! 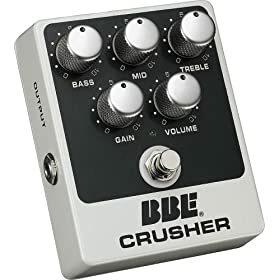 I found this small video clip of the BBE Crusher as well as the BBE Sonic Stomp.